CHICAGO & SAN CARLOS, Calif.–(BUSINESS WIRE)–BioCardia®, Inc. [OTC: BCDA], a leader in the development of comprehensive solutions for cardiovascular regenerative therapies, today announced positive 12 month data for the roll-in cohort of its pivotal CardiAMP™ Heart Failure Trial studying the investigational CardiAMP Cell Therapy System in adult patients experiencing heart failure following a heart attack. The results were presented today by Peter Johnston, MD, of Johns Hopkins Medical Center at the American Heart Association Scientific Sessions 2018. 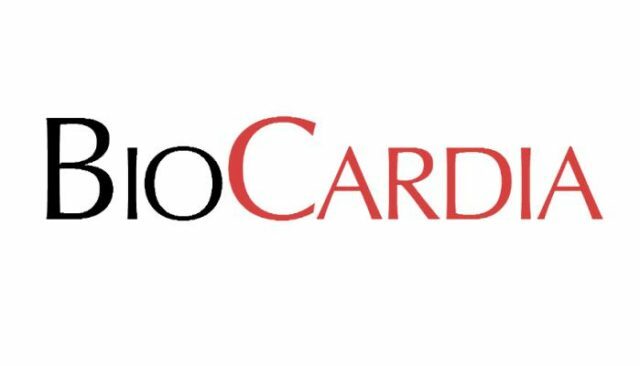 BioCardia, Inc., headquartered in San Carlos, California, is developing regenerative biologic therapies to treat cardiovascular disease. CardiAMP and CardiALLO cell therapies are the Company’s biotherapeutic product candidates in clinical development. The Company’s current products include the Helix™ Biotherapeutic Delivery System and the Morph® steerable guide and sheath catheter portfolio. BioCardia also partners with other biotherapeutic companies to provide its Helix systems and clinical support to their programs studying therapies for the treatment of heart failure, chronic myocardial ischemia and acute myocardial infarction.